You knew I’d milk this roller coaster trip on forever in my blog posts didn’t you? On our third day of our adventure, we bid farewell to the City of Sacramento and flew on Southwest Airlines to Burbank Airport in the Los Angeles area. I do like flying into the smaller airports because it is easier to get in and out in a timely manner. Both Alaska Airlines and Southwest Airlines flew into Burbank Airport so this worked out well for us since our return flight back to Seattle was departing from Burbank.When I was planning this trip, I wanted to fly in as close as I could to Six Flag’s Magic Mountain Park and Burbank was the closest major airport for me. My original plan was to fly into Sacramento, rent a car, visit friends in the Sacramento area, do the Six Flag’s Discovery Park, and then drive to Magic Mountain. That plan fell apart when the cheapest rate I could find on any rental car website or kayak or hotwire or anything was close to $800 for a short five or six day rental. It was expensive due to the fact I was picking the rental car up in one city and returning it in another. My original plan also produced a lot more driving and car time that we wanted to do. We are vacation for the rides not to be taken for a ride by the rental car companies. We used Fox Rent a Car which had some terrible reviews online but we fine for us. It was a short ride from the airport to the rental car company base. 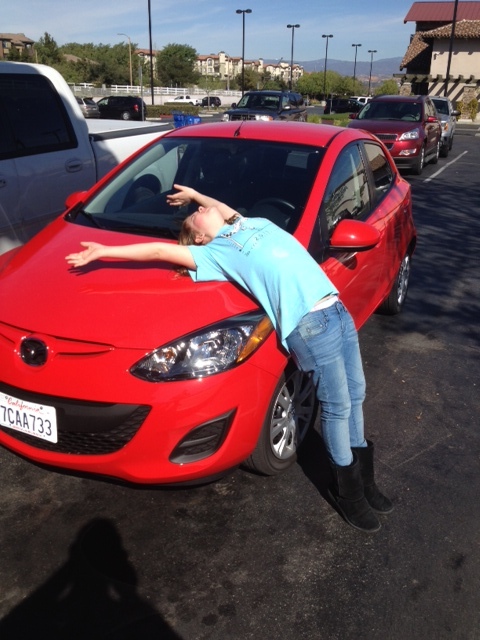 We got a sporty little four door Mazda 2 with only 500 miles on it. Not a bad little car for the two of us. I thought about having my daughter drive it but considering she is only 11 years old and it would be her first time in LA traffic, I decided against it. 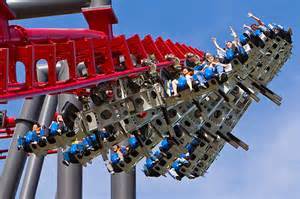 Now, when you are visiting amusement parks in February Six Flag’s system of parks might not be open seven days a week. So our only window to visit Magic Mountain was on Monday February 17 (President’s Day). The park hours are limited as well from 10:30 am to 6 pm and the water rides are usually shut down. Since we had purchased season passes at Discovery Kingdom the day before, we merely had to park our car for the outrageous sum of $20 and walk though the main gates of Magic Mountain without purchasing new tickets. I remember passing by Magic Mountain 20 years ago thinking I’d get to it one day. Finally, this day had come. Finally, I had a kid who wanted to ride the big scary rides. Finally, I had a roller coaster ride partner that wouldn’t wimp out on me. I was finally here. To be honest, I like coming on the off season because the lines are much shorter. The newer rides had the longest rides which ate up a lot of our time. X2 is the latest redesigned ride and it was awesome but the line took forever. When a sign says the wait will be 45 minutes, that is OK. When it turns into 75 minutes, then I get a little pissed off. We didn’t make it to the Full Throttle ride because we ran out of time and the ride looked scary long. In fact, we had to skip some rides due to running out of time and having to ration our time for the rides that we heard were awesome. However, on others we rode it three times just because we could. 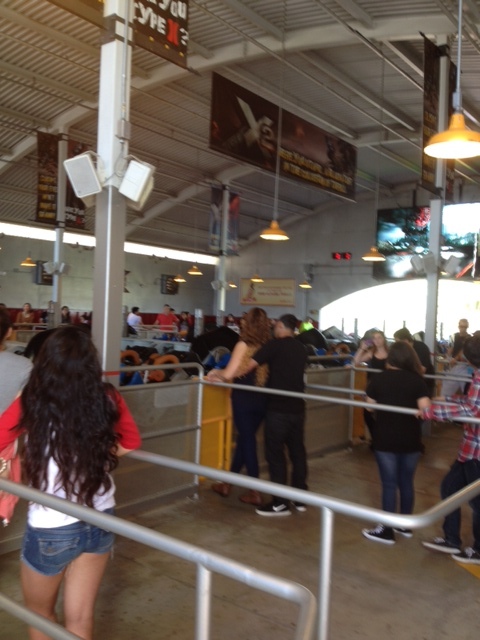 Goliath, Tatsu, and X2 were my favorites. I tried to look up my daughter’s favorite ride but the Magic Mountain website is down (sorry folks!). Waiting for X2 – almost there! Definitely need to have two days at Magic Mountain (even in the off season) to get to all the rides into your schedule. I can’t imagine how it is on a busy summer day with more people wandering the park, trying to get in as much as possible. The lines have to be almost impossible. We didn’t even get to the wooden roller coasters since they aren’t my favorites because we ran out of time. Personally, I like the speed and loops of steel roller coasters so skipping the wooden ones wasn’t an issue for me. As anyways, your comments and sarcastic witty comments are welcome. Shhhhh I’m going to get John to go to Six Flags. He hates roller coasters. You are so lucky that your daughter loves them. It will be awesome. I want to comment on the parking , OUT FREAKING RAGEOUS!!! Buy the season pass and you get parking at one park included. Then you can drag John to all the Six Flag parks in California and beyond! !